The Stateless Dignity team comprises a small but highly motivated group dedicated to advancing the rights of the stateless and refugees/displaced persons, to advocating for their safety and human dignity, and to accurately depicting their lives and experiences to empower them, amplify their voices, and strengthen the global human bond. Stateless Dignity does not currently have any staff positions available, but we hope to in the future, so please do keep in touch and check back. In the meantime, we welcome interns, fellows, and volunteers, as well as other voluntary contributions: be they photography, writing, news tips, or other submissions. To join our internship, fellowship, or volunteer programs, please see our Opportunities. Finally, if you would like to see our staff and programming grow—and, ideally, establish new programs to support other stateless groups—we ask you to please consider donating. Ashley is an international human rights/humanitarian lawyer and freelance writer with global experience in statelessness, armed conflict/genocide law, and refugee/displaced persons' rights, particularly in South/Southeast Asia and sub-Saharan Africa. Over the past five years, she has focused her work and studies on issues facing the Rohingya population. Ashley was present and working as a field researcher in Myanmar's Northern Rakhine State—unbeknownst to her then, the soon-to-be epicenter of mass atrocities—on August 25, 2017: the very day the humanitarian crisis erupted there. Following her expulsion from the region, Ashley published on the topic in various news outlets, including the Washington Post, Al-Jazeera English, the Dhaka Tribune, and Oxford’s Tea Circle, and has spoken at such events as the Paris International Rohingya Conference, the uOttawa Symposium on the Legal Dimensions of the Rohingya Crisis, and the LA Convention on the Ongoing Myanmar Genocide. To see some of her published works, please see our Journalism page. Prior to these endeavors, Ashley also worked with several other international organizations, including the UN Office of the Special Adviser on the Prevention of Genocide, The Carter Center, and the International Senior Lawyers Project, among others. She is a graduate of Columbia Law School (JD), the Middlebury Institute for International Studies (MA), and New York University (BA), and is the former Editor-in-Chief of the Columbia Human Rights Law Review, the top-ranked human right law journal in the world. She has also previously published and spoken on Cambodian post-genocide reconstruction and peacebuilding efforts, including in the Women’s International Perspective and at the 2009 International Studies Association West Annual Conference on the Human Consequences of State Political Inaction. In her spare time, Ashley is also an avid traveler, an unpaid Apple proselytizer, and positively atrocious surfer/climber. For more on Ashley's personal and professional background, please visit her personal website, where you can find her CV. And to learn more about the experiences that led Ashley to found Stateless Dignity, please visit our Founder & Story page, as well as to her aforementioned journalism. Sangeetha is an international lawyer based in Singapore, where she currently works for the ASEAN Corporate Social Responsibility Network (ACN). At ACN, she focuses on Business and Human Rights, supporting the adoption and implementation of internationally accepted standards and norms, and in particular, the UN Guiding Principles. She previously served as a researcher on rule of law in Asia with the Konrad Adenauer Stiftung Foundation, and on humanitarian assistance and disaster relief with Nanyang Technological University. Sangeetha has worked in international law in various capacities. She began her human rights journey working at the Khmer Rouge Tribunal in Cambodia, where she continued as a litigation and transitional justice associate, helping to represent victims before the Tribunal. Once called to the Bar, she worked with Singapore’s Ministry of Foreign Affairs on international boundary issues, and later, with the International Criminal Court and Interpol. 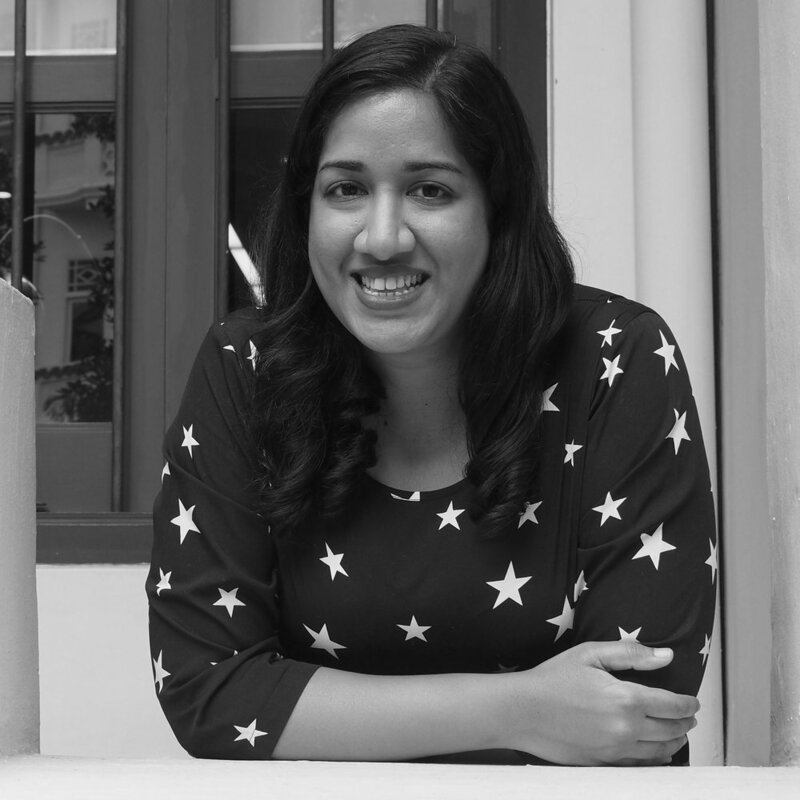 Sangeetha has also spent time working in the occupied Palestinian territories on humanitarian law violations, as well as with Rohingya refugee communities with the UNHCR in Malaysia and with various NGOs in Australia. For two years, Sangeetha stepped out of her more legal roles to work with Save the Children, where she supported humanitarian response and emergency preparedness throughout Asia, and was deployed to the humanitarian responses for Typhoon Haiyan in the Philippines and the Nepal earthquakes. She now volunteers with Relief SG, a local humanitarian organization, and recently undertook a humanitarian mission to the Rohingya refugee camps in Cox’s Bazaar, Bangladesh. Sangeetha is a qualified Advocate & Solicitor in Singapore, and holds an LL.M. in Public International Law from the University of Melbourne, an LL.B (Hons) from the National University of Singapore, and a postgraduate diploma in Poverty Reduction Policies and Practices with the School of Oriental and African Studies, University of London. Currently, she is also pursuing an applied Master's in Peacebuilding and Conflict Resolution in Cambodia on a part-time basis. Sangeetha has a constant case of wanderlust and hopes to see all, if not most of the world—and in an alternate universe, would love to live in Middle Earth. To learn more about Sangeetha and her work, you can visit her LinkedIn page. Leif Kennedy is an Australian-born, Brooklyn-based photographer. He started studying photography in 2015 and is particularly interested in documentary photography as a medium to instigate change. In 2018, he started serving as the photographer for the Stateless Dignity Project. He has since traveled to the refugee camps in Bangladesh to help document the ongoing struggles of the Rohingya in support of the organization’s Rohingya Program. His work can be found throughout SDP’s website and social media outlets. Outside of photography, Leif works a day job as a molecular biologist and loves to surf and travel. He studied Biology and Chemistry at the University of Central Missouri, where he also ran track and cross country. To see more of Leif's work and to learn more about him, please visit his portfolio. Heather Eisenlord is a partner in the New York office of RPCK Rastegar Panchal, a boutique corporate law firm that has deep expertise in the impact investing sector. Her practice focuses on complex domestic and cross-border financings, many of which embed multiple bottom line objectives. In this role, Heather advises borrowers, lenders, credit enhancers, investors, asset managers, and growth-stage companies in connection with senior secured credit facilities, project financings, program-related investments, mezzanine, junior, and hybrid products, and fund formation. She has advised on diverse transactions involving infrastructure, renewable energy, clean technology, public health, housing, agribusiness, franchises, funds-of-funds, and commercial real estate. Prior to joining RPCK, Heather was the Director for Inclusive Development at the International Senior Lawyers Project (ISLP), where she developed and managed global project portfolios that protected communities from potential life and livelihood harms associated with land-based investment and promoted expansion of the impact investing field. She also managed a broader portfolio of human rights projects, which included initiatives focused on displaced populations and statelessness. Her work at ISLP was principally located in East and West Africa, Southeast Asia, Haiti and the Dominican Republic, and the Andean region of Latin America. Heather also previously worked as a senior banking associate in the New York office of Skadden, Arps, Slate, Meagher & Flom LLP. She also practiced in the New York office of Arent Fox LLP, focusing on public and real estate finance. Heather received her BA in Political Theory and Constitutional Democracy at the James Madison College of Michigan State University, and she earned her JD, with highest honors, from The George Washington University Law School. She is a member of the New York bar. For more on Heather and her work, interests, and background, please visit her LinkedIn page. Hasibul Haque Imon is a Bangladeshi law student currently living in Dhaka and working as a legal assistant in a corporate law firm. Imon has also volunteered with several social justice-oriented organizations, including the One Degree Initiative, which works to empower youth and foster youth-led development through community service. He has also worked with Amanush, which assists street people in need. Imon firmly believes that it is our duty raise our voices rather simply ignoring what we don't like in the world. He is thus eager to set a new standard by becoming a practicing lawyer in Bangladesh and working to ensure justice for disenfranchised individuals and groups. Imon loves speaking and storytelling, and is passionate about one day becoming a public speaker. He is also dedicated to making the cyber world more secure and accessible to users. In light of these interests, he aspires to be one day become a politician in Bangladesh to help his own country, as well as to become an entrepreneur. In his free time, Imon also enjoys writing, vlogging, travel, politics, cinema and music. Among his life goals are to travel to at least twenty percent of the world before he reaches fifty; to direct and produce his own film based on his life experiences; and, one day, to form a band. In person, Imon is very talkative thanks to his experience as a teacher (and as his students will attest!). Although he has many passions, at his core, Imon is an "Idea Evangelist" and looks forward to putting his ideas and passions into action in many ways and as soon as possible. To learn more about Imon, his work, and his interests, please visit his LinkedIn page.